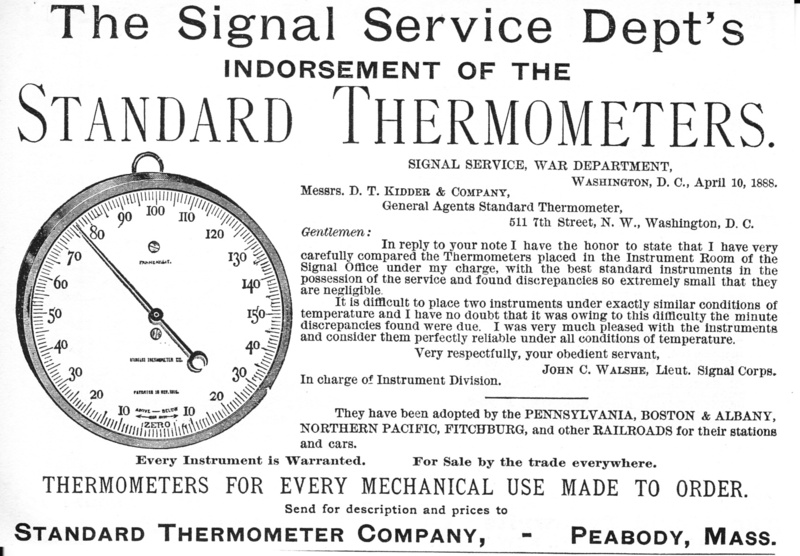 The Standard Thermometer Company was founded in Peabody Massachusetts in 1885. I don't know how long Standard was in business, I believe at least until the 1930s. They relocated to Boston by 1909. Their trademark of 'Standard' expired in 1992. A Standard dial thermometer is shown in the 1936 CENCO catalog available on this website. To the left is a photo of their building in Peabody, which they occupied until at least 1901. If anyone has a Standard catalog or information about Standard, please email me. ​​To the left is a cut from a 1912 trade catalog showing Standard thermometers for commercial use.